The mazurka originated in the Polish province of Mazovia, near Warsaw. In the seventeenth century, the dance began to spread beyond the boundaries of Poland. Stylized mazurkas, such as Chopin's, combine aspects of this and several other dances, but some characteristics are consistently present: an accented third beat (occasionally the second) in a 3/4 measure; the use of both the natural and raised versions of some scale degrees, particularly the fourth; and a drone bass. During the 1830s and 1840s "art" music mazurkas were very popular in drawing rooms throughout Europe. Some of the melodies of the mazurkas are unusual in comparison to the melodies of European "art" music. Many of these are related to folk mazurkas in their "modular" melodies consisting of tiny rhythmic and melodic units. Also, some use cross rhythms, chromatic scales, and modes typically not found in Western music. Often, we find remote keys used as colorful excursions from the tonic. Most of Chopin's Mazurkas are in strict ternary form, some of them actually sporting a da capo to indicate the return to the first section. Chopin's later Mazurkas are stylized and often the testing ground for some of his most experimental ideas. Unlike other Romantic-era manifestations of "folk" music, Chopin's Mazurkas contain no actual folk tunes. He uses typical rhythms, melodies, and rhythmic and cadential formulas associated with Polish music and combines them in an original way. Chopin borrowed sounds he found outside European "art" music and used them to create music within that tradition. 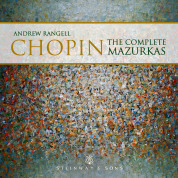 Some consider Chopin's mazurkas to be the most original of his works. Like the Mazurkas, Op. 64, the Mazurkas, Op. 68 is a collection of works Chopin did not publish during his lifetime, but the period of time they cover is much wider--nearly the entirety of Chopin's career. The first and third, in C major and F major, respectively, are from 1829. The second, in A minor, dates from 1827 and the fourth, in F minor (Chopin's last work), was composed between May and July, 1849, and left as a sketch when Chopin died. The four were published as a set in 1855 in Berlin, with No. 4 in a shortened form. A fuller, more accurate version of No. 4 was completed by Jan Ekier in 1965. Chopin's last Mazurka, that in F minor, Op. 68, No. 4, is an example of the composer's occasional, extreme chromatic adventures, this time from F minor into A major. This outrageous journey begins in the fourth measure, although the first eight-measure phrase closes firmly on F minor. The repeat of this phrase, however, is highly decorated and gives in to the urge to modulate as constant eighth notes in the right hand move quickly to A major then slowly back to F minor. The chromatic slithering continues in the trio, with its alternately halting and flowing theme that at points moves in two voices. Chopin touches on D major in the trio before closing on F minor for the literal return of the first section. Chopin marked a return to the opening at the end of the trio and included in his instruction, "senza fine" (without end), suggesting the piece should go on indefinitely. Editors of the various printed editions, however, place a "Fine" marking at the very end of the first theme complex, on the second beat of the measure.